Stan Cohen was my first teacher and inspiration in sociology. He taught me social psychology and the sociology of deviance as a student at Enfield College in 1965 and 1966 – and he showed me what a non pompous intellectual life could look like. His ideas inspired me as I turned to ‘homosexuality’ – as it was then- as a personal area for my own understanding and research. He supported me in following a PhD; and encouraged me to apply to Essex University for a job in 1974. For a while , he became a colleague. His book States of Denial can be seen as a fine example of humanist sociology. Meeting Stan was probably the single most influential shaper of my academic life. 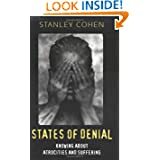 Stanley Cohen is a prominent world leader in sociology, criminology, and human rights. Born in Johannesburg, he moved to England in 1963 and became a psychiatric social worker before doing his Ph. D.at the London School of Economics. He subsequently taught at the Universities of Middlesex and Durham, and was Senior Lecturer and Professor of Sociology at this university between 1972 and 1981. In 1981, Stan left for the Hebrew University of Jerusalem with his wife Ruth and their two daughters, Judith and Jessica. He returned to the UK in the mid 1990’s and is currently the Martin White Professor of Sociology at the London School of Economics. Stan’s work has always shown a deep concern for the oppression and suffering of others. In South Africa as child and youth, he saw the horrors of apartheid at first hand. In England and the United States he witnessed the inhumanities of a so called advanced criminal justice system. And in Israel he came to detest the atrocities generated through the Israeli-Palestinian conflicts. The thread that holds all his work together is a passionate preoccupation with the often unnecessary sufferings of people living under systems of social control – from the smallest regulations in our everyday lives, through the workings of courts and prisons, and on to mass systems of torture and genocide. An intellectual maverick, he has always been radically critical of orthodox criminology and has – over the past forty years – been consistently at the forefront of its re-thinking. His earliest research-published in 1972 as Folk Devils and Moral Panics- was on youthful delinquencies and vandalism. This was a study of the big English youth phenomena of the 1960’s – which many of us slightly older members might well recall – the rise of the so-called ‘Mods and Rockers’. After the teddy boys of the 1950’s these were the first major youth phenomenon of the post war era, and sparked off a great deal of controversy. They seemed to turn the local beaches of Clacton – just down the road from this university- into a battle ground. But Stan had an unusual take on all this: for him the Mods and Rockers came into being, at least in part, because of the very responses of media, police, and courts — who helped define and shape them. It is in this book that Stan introduces the term ‘moral panic’ – to capture the heightened awareness of certain problems at key moments. It is an idea now widely used and known to every A level student of sociology, as well as many members of the public. The core idea of the book is that interventions – usually in the name of benevolence or ‘doing good’ – can sometimes actually make situations worse not better. would arrange to have speak in his university seminars. This was a period of active involvement in various prison reform movements, and it led him to a much wider concern with the ways in which control systems were changing across the world. During his time at Essex, this was the prime focus of his research. His 1984 book Visions of Social Control mapped out the extensive growth of modern systems of social control: the old penal system of prisons remained and indeed got larger, whilst a whole new system – surveillance, community programmes, therapies and medicalization was now mapped on top of it. In all of this, we were witnessing a major extension of social control over our lives. Stan’s work has always been committed to the underdog; but it took his move to Israel for him to enter a much more overtly political and radical stance. As I see it, this was one of the most unhappy periods of his life – although he loved the country, he and Ruth came to hate the surrounding politics and increasingly saw and felt despair. This period resulted in his most recent book States of Denial: Knowing about atrocities and suffering, which was the winner of the British Academy Book Prize in 2002. Here he charts the ways in which man’s continuing ghastly inhumanity to man – all over the world – can happen because so many people deny its existence, refuse to see it and carry on as if nothing terrible has happened. This has taken Stan further and further into the field of human rights. The world Stan sees is a world full of sufferings: wars, torture, wrongful and dreadful imprisonment, genocide. Whilst there are both people who are the victims of this, and others who victimize, Stan’s concern is with a third group: those who turn a blind eye and refuse to see what is going on. Stan asks: Why do people not see, fail to see, persistently deny the horrors that are going on all around them? Why do they say ‘there is nothing I can do about it’? Across the world, millions of lives are ravaged on a daily basis; and most people simply do not want to know. In this there is an ironic twists to his research. Whereas thirty years ago he saw issues like ‘mods and rockers’ as media events that gained an exaggerated importance, his work these days looks at events like torture and genocide which seem to be given too little attention in the media. Although Stan is an intellectual pessimist who agonises over the state of the modern world, he is also a remarkably kind, warm and humane man. He treats people as people should be treated. So, although the world that Stan Cohen has studied and campaigned over during the past forty years may be a brutal one, he does find consolations. His great joy, outside of the intellect, is for jokes. He collects jokes, pursues web sites for jokes, and it is hard to stop him telling a joke (I suspect he might even tell you one later on!). Indeed, one day he hopes to write a book about jokes. In the midst of so much pain and suffering, Stan looks to the absurd and the humorous to find a certain comfort. When asked recently what he considered the most important things in life he replied without hesitation: friendships. In the delightful Christmas film by Frank Capra, It’s a Wonderful Life, the hero (played by Jimmy Stewart) is taken back by his guardian angel to see just what life and the world would have been like if he had not lived. As Clarence, the guardian angel says : ‘ Each person’s life touches so many other lives. If they were not around, it would leave an awful hole’. So with Stan Cohen, it is not just through the big books that he has published over the years that change has been affected; it is also in the small acts of kindness, the little refusals to go along with the crowd’s inhumanities, the small joys of everyday life. Stan’s presence has had a pronounced impact on many people’s lives. Indeed, he was my first teacher of sociology, as he has been for many others, so I know at first hand his gentle, humorous touch that brings inspiration and comes with a profound wisdom and concern. Stanley Cohen is a man who has made a difference. He has touched many lives through his teaching, his research, his writing, his activism and the manner in which he conducts his day to day life. It is a privilege for me to give this oration and for this university to honour him today. Posted by kenplummer on July 12, 2012 in Imagining Better Worlds, Insipirations, Politics and change, Sociological Imaginations and tagged humanism, sociology, Stan Cohen.